How to install shale shaker? How to install shale shaker is a very important problem, there are many types of shale shaker. They have own different purposes, and different shale shaker have different install method. Generally, the installation process of shale shaker is very complicated. The screen can be used alone or have two or more combined in which slurry influx pipe manifolds can be made according to the users’ requirements. Screen is an expensive wearing part for this equipment, the quality of its installation will directly influence its service life. A bolt stretching device is adopted to fix the screen cloth. When slurry discharging quantity is too much or escaping because of a higher viscosity, the screen box’s dip angle should be regulated. The best dip angle is that one preventing slurring from escaping. The screen box’s dip angle of the facility can be discretionarily regulated by the values including -1°, 0°, 1°, 2°, 3°, 4°, 5°. When adjusting, the oil return valve of the hand pump should be screwed down firstly and tightly. At the same time, lightly press the manual rocker until the lifting slide bushing will be going up a little. By this step, have the pin drawn off with pressurizing finished manually. The movement of the hydraulic cylinder will change screen box’s dip angle. When the regulation finishes, the facility will not resume its work until the bolt pin is inserted with oil return valve unscrewed. While the screen is in its operation, the slurry should cover 3/4 of the screen cloth. If the covered area is not up to the standard, it shows that the screen mesh is too thick. And to improve its purifying result the screen with thin mesh must be replaced. In order to prevent any damage during transportation, please remember: the locking yoke should be tightly locked in transportation, making sure that there is no relative movement between screen box and pedestal. The locking yoke should be unlocked before its starting, otherwise, the machine will be seriously damaged! Aipu is a professional manufacturer of solids control system in China with many years rich experience, which can offers a complete line of solid control equipment. 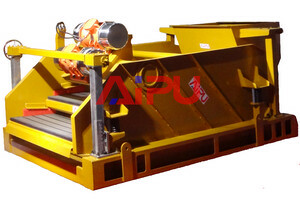 If you are interested in shale shaker or other products, welcome to Aipu solids control enquiry.